There's a man standing against the side of an old brick building at the corner of an alley. He looks around nervously and is doing a bad job of hiding the fact that he's trying to obscure his face with his trenchcoat collar. This must be the blogger you agreed to meet. He sees you and beckons you over before immediately retreating further down the alley. You follow and meet him in the privacy offered by the surrounding buildings. "Hey," he grunts and looks around one more time. "What are you buyin'?" "Dunno. What are you sellin'?" you reply, keeping your voice low. The man's eyes light up slightly, acknowledging your code words. With a decidedly untrustworthy grin, he opens one half of his trenchcoat, being sure that only the outside is visible from the street. Inside, you can see the goods: screenshots of an Excel spreadsheet. You look them over, making sure not to appear too interested, lest he try to raise the price. "You say you got these without a non-disclosure agreement?" you ask, even though you've already decided that you're buying either way. "Yeah. Sure. Whatever. That's what I said, right? You buyin' or what?" the man answers quickly. You can tell he's getting antsy and isn't in the mood to haggle over a price or make idle conversation. "Fine," you mutter abruptly and pull out your heavily-used and partially damaged smartphone. After transferring the agreed upon amount of Dogecoins to his account, you show him the confirmation screen. With a grunt, the man hands over the screenshots and is gone by the time you look up from checking them over. So what's it like to translate a Japanese game to English? And what did that introductory story have to do with anything? To the first question, it's pretty cool; and to the second, not much, except that I have some behind-the-scenes screenshots of an Excel spreadsheet to show off. Let me say, I am no expert on this subject at all. I have a B.A. in Japanese language, but I've only ever translated games for fun. I did, however, apply for a translation job for a visual novel game for iOS and Android devices, for which I got turned down. As a sort of audition, I was given a sample to translate, which came with general instructions in a Word document (telling me make sure the translation wasn't too literal and sounded natural in English, with various examples of what not to do), specific instructions in a Power Point presentation (telling me which areas needed to be translated, how the relevant coding worked, and about character limits), and finally, an Excel spreadsheet containing the text to be translated. Usually, this kind of thing is kind of secret, but in all the instructions and correspondence, no one ever told me not to share this stuff so... lucky you - I'm sharing it! Keep in mind that this is only one example of one game, in one genre, on one (or two) platform(s). Game text from other games may look completely different. 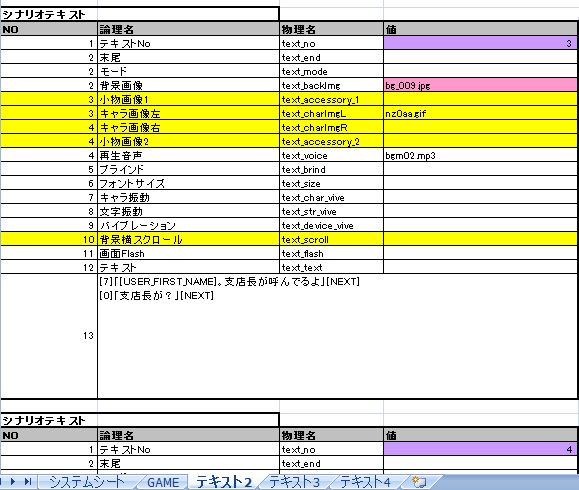 As you can see, the spreadsheet contains multiple worksheets. 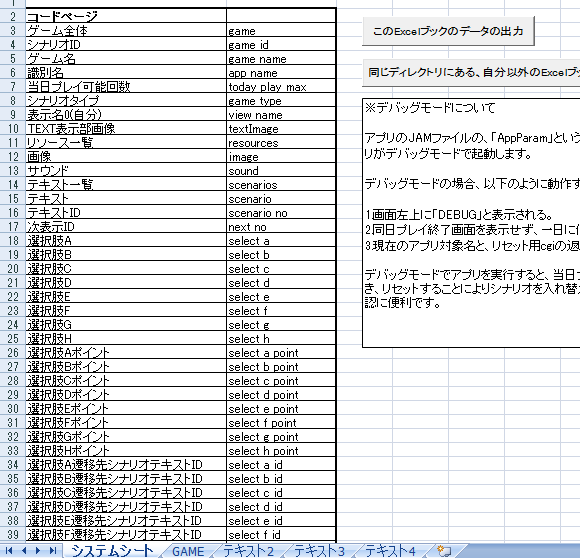 This first one is labeled "System Sheet" and contains the "Code Page" table, which explains the meanings of the English variables and parameters in Japanese. On the right, it also explains how to access debug mode and what can be done in debug mode. Nothing on this page is relevant to the translator. 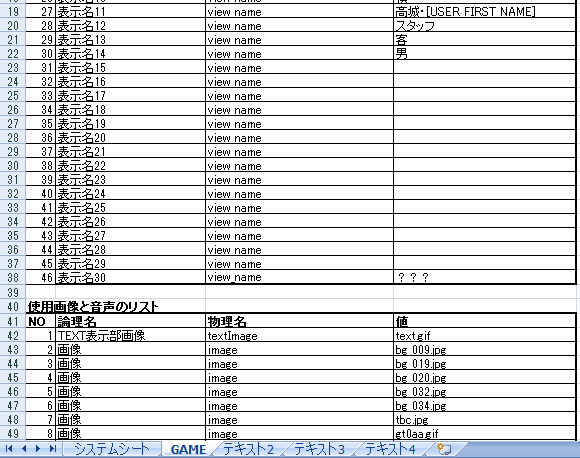 The GAME tab contains character names and image file names. Not shown in this screenshot (on purpose), is also the game's title and ID and other header information. On this page, the translator must translate the character names, which can be no longer than eleven letters. This can be a bit tricky, since some of the names could have multiple possible pronunciations and their intended pronunciation wasn't given to me in this sample (nor were their character portraits, for that matter). Later on in the process, names can also become an issue because it is common to refer to someone by their last name in Japanese at times when it would be weird to do so in English. There are also times when you'd use someone's name in English, but in Japanese, they'd use the person's title (like "brother" or "upperclassman"). In addition to that, a character's gender can be difficult to determine unless explicitly stated, since you can get by just fine without saying "he" or "she" in Japanese. The bulk of the text to translate is on the numbered "Text" tabs. The part that needs to be translated is only the dialogue in row 13. All of the information above that tells the game which backgrounds, character portraits, font sizes, and effects to use. Although there were no examples of it in this sample text, it is also possible to give the player decisions on this page and redirect them to different text depending on their choice. In the dialogue box, the number in brackets determines which character is speaking and refers back to the character names table. In this example,  is the player's character and  is some other character. Each line of dialogue can only be up to 90 characters long, so this can sometimes present a challenge when translating, as Japanese words and sentences are written in much fewer characters (thanks to kanji and a lack of articles). However, it is possible to add more lines if needed; you just have to format it correctly. The other "Text" pages are more of the same, so that brings us to the end. I hope that you found this look behind the scenes to be interesting (unless you're the company that made this game, in which case, you never told me not to do this! I'm innocent!). "Can't get enough of this stuff, eh?" The mysterious blogger grins and gives a wheezy, phlegm-choked laugh. "How about we make it more interesting this time," the man says while reaching into his pockets to pull out several hyperlinks of varying color. He continues, "You get a choice. Click a link and you might find something you like. Or," he grins and cackles again, "you might not. 's up to you; I ain't gonna make ya." "So, what'll it be, you gonna play or what?"